Last updated 16 November 2018 . By Olivia Cheves. We’ve barely settled into our seats at The Lucky Pig before my companion is exclaiming that she would, and I quote, 'die for this aesthetic’. I’d wager she’s not the only one as this Fitzrovia cocktail spot has quite the look going on. 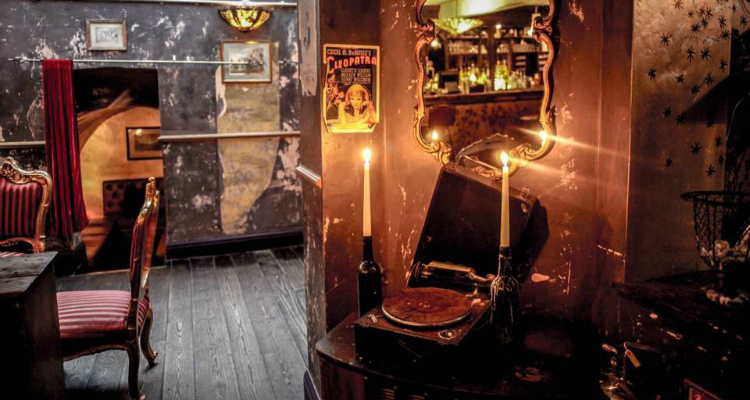 Somewhere between a protection racket HQ and a Bohemian brothel, the basement bar proffers distressed walls, distressed furniture, not quite so distressed light fixings and distressed, vintage wall art. One thing that’s certainly not distressed, however, is their cocktail offering, which have garnered the bar quite a reputation. They’re in the process of finalising their new A/W18 menu and we were allowed a sneak peak - or four - at the goods. Distressed in only the best possible way, the interiors will transport you to a bygone era. First up is an aperitif made from Athenian vermouth, lemon bitters and Fever Tree aromatic tonic. The goldfish-coloured concoction provides a refreshing cocktail lighter than a Negroni but with more bite than an Aperol Spritz. The Through The Grapevine is a lighter follow-up. At the base, a chamomile-infused grappa paired with a Corsican vermouth, then set to with Limoncello, muddled fresh grapes, basil and egg white for a frothy finish with just the right balance of light grape flavour, fragrant basil and sourness from the grappa and Limoncello. It might be a Tuesday, but the bar is far from subdued, with a full cross-section of get-togethers on show. In one corner a birthday party well-wishes over colourful concoctions, while cackles erupt regularly from a curtained-off alcove as a group of girls crack onto their third bottle of white. At the bar, a post-work group put in their throwback song requests with the acoustic guitarist, and on another sofa a couple murmur drunk nothings at each other. 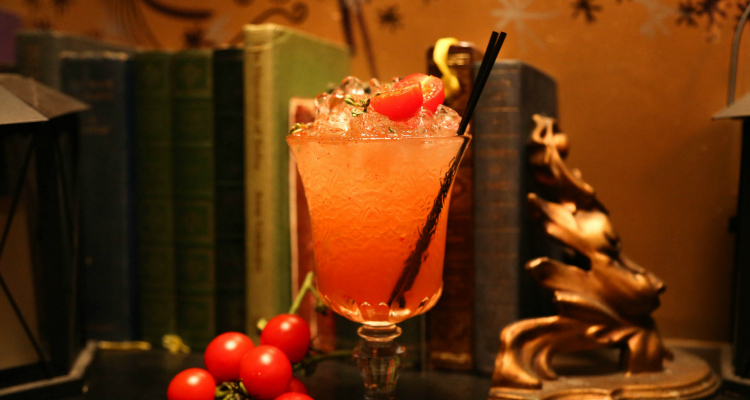 The bar aim to keep their cocktails seasonal using fruit, vegetables and garnishes accordingly. As our third drink arrives I start to get an idea of how these things escalate. Served in a giant silver flagon and garnished with rosemary, ground pepper and whole slices of beetroot, this next cocktail is a mix of pink pepper gin, a vibrant beetroot eau de vie, chilli jam and grapefruit. Part of the bar's commitment to keeping its ingredients seasonal, it’s got some heart to it, to say the least. With the aroma of rosemary and earthy beets, it smells like a garden centre and tastes like a juice you’d knock up on the first day of your short-lived health kick - with the hit of gin being the flavour of failure come day three. Japanese dry gin, house-infused lavender umeshu and more vermouth follow, in a fragrant and flavoursome cocktail that can be slurped down far easier than its pungency may make you believe. Thankfully, though, there are snacks on hand to soak us up and we’re presented with a tasty mixed platter of British meats, cheeses, crackers and chutney (£14) which we happily chomp on as we gulp down the last of our drinks. Proving itself a bar for any and all occasions, The Lucky Pig has got you covered for everything from dates and catch-ups to parties and post-work bevs. Intriguing cocktails and fabulous food selection aside, it’s got style, energy and atmosphere by the flagon-load.